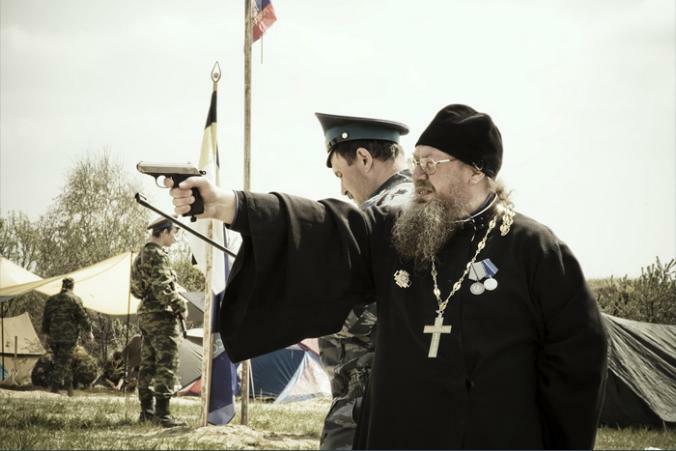 A Russian Orthodox priest. The church is a bastion of reaction, and harkens back to the “glory days” of Tsarism. It’s also closely aligned with the Russian military. The forces that the Republicans stirred up that brought Trump into office are similar to those that Putin rests on in Russia: National chauvinism, religious fanaticism, sexism and racism. Putin, however, is a global strategist whereas Trump is a narrow-minded demagogue. Now, things in Russia are coming full circle, with the same unstrategic fanaticism that Trump represents starting to grow out of control in Russia. The Republicans created a monster in the religious fanatics and racists that they encouraged. This brought Trump to power. Putin has created a similar monster and now, in its own way, it’s starting to grow out of control. “Last month, Russian Orthodox extremists attempted two acts of terror. In the first, they crashed a car loaded with gas canisters into a movie theater in Yekaterinburg on September 4. Then, on September 11, they burned cars near the Moscow office of Konstantin Dobrynin, a liberal former senator. The attacks were motivated by the religious extremists’ opposition to Matilda, an upcoming movie by director Alexei Uchitel (who retains Dobrynin as his lawyer) that the protestors have deemed blasphemous. The film tells the story of Czar Nicholas II’s premarital love affair with ballerina Matilda Kschessinska. Scheduled for release in October, it has already enraged religious conservatives because the last czar and his family are saints in the Russian Orthodox Church. On August 31, religious extremists even threw Molotov cocktails at the director’s studio in St. Petersburg.”President Vladimir Putin could have easily cracked down on this campaign and reprimanded Natalya Poklonskaya, the parliamentarian from Crimea who instigated it through various media appearances and speeches in the Duma. The fact that he hasn’t done so exposes a gaping paradox at the heart of his authoritarian rule. Natalia Poklonskaya, member of the Russian parliament from Crimea. She’s the leader in this religious fanatical campaign. “In recent years, Putin has been happy to inculcate a conservative, nationalist ideology in Russia, which much of the Russian Orthodox Church has supported. And he has encouraged protestors, worshippers, and ordinary Russians to propagate this creed to demonstrate that this is a grassroots movement, not something imposed from the top down by the Kremlin. Another example of religious fanatacism running amok. Another example of the crisis of capitalism.